Happy 3rd birthday James! You look so handsome and happy! Hope you are having the best day! Congrats to you too, Fluffygrams! Aww James looking ever so handsome and very young for his 3 years! WOW at the big 3. Charlotte is growing well now and is of a similar size to Victoria. She's been practising her stashing and nest building which will be a useful skill if things go well as she will be up for breeding soon. Unfortunately Cora's diabetes has meant that I'm going to have to delay using Jack and Alex for a bit longer in the hope that they avoid the condition. However their father, Lord James seems like he might still be up to the task and has been proven to be effective. Lord James has another wife lined up in addition to Charlotte making Charlotte and this other girl, his fifth and sixth wives. 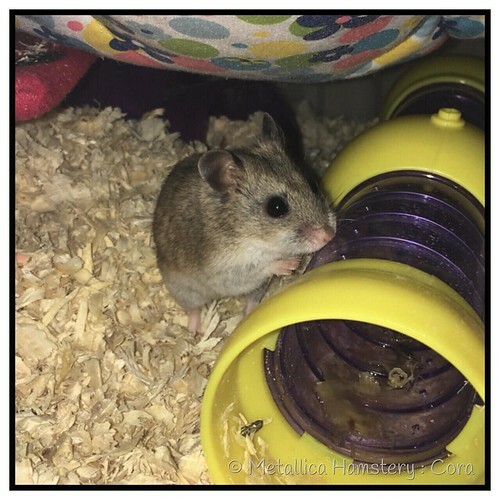 Diabetic Cora is still going, still being busy and hasn't really got worse since developing diabetes and now we've found a food she'll east, she seems happy. 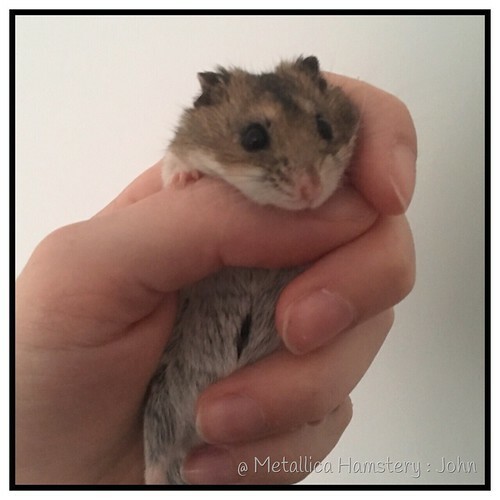 Unfortunately Lucas, who arrived at Metallica just a month ago developed diabetes not long after his arrival here. 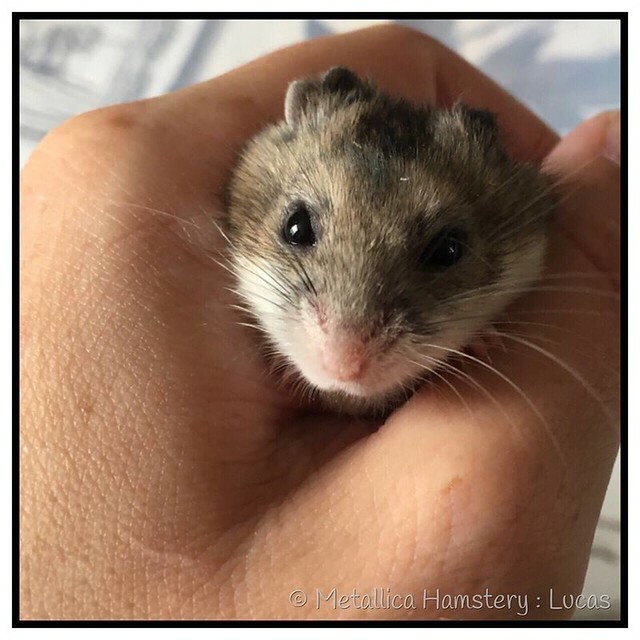 He's only four months old and is already ketonic so has less of a positive prognosis. He will never make the show team or be used in breeding, which is a shame because he's a nice looking lad who could have brought some nice features back into my breeding lines. The show team is in the hands of Jack, Alex, Ben and Charlotte with Juno and Joshua as reserves. I was looking through some photos yesterday and I found this one of Matthew when he was 4 weeks old with one of his brothers. 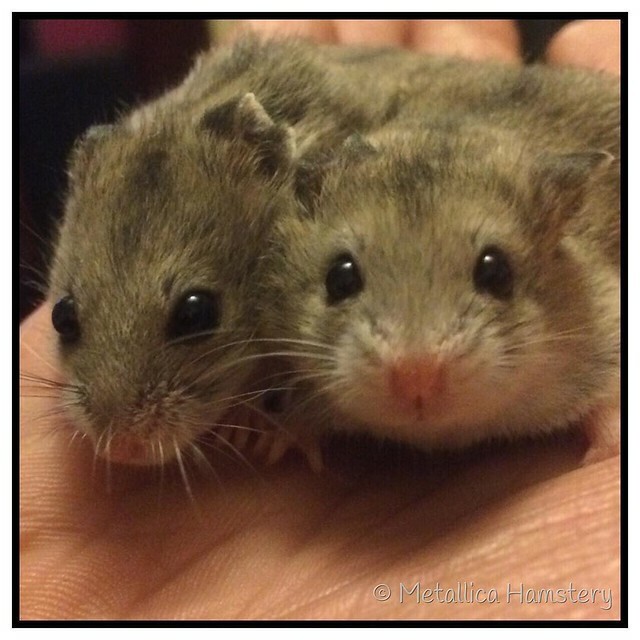 Even as a baby, he had a cheeky face and it's a face that I'm missing every time I go into the hamster room. Your boys as little ones in the last picture are absolutely adorable! They looked so cuddly as babies. Sorry to hear about Lucas, I hope all turns out alright. It's been a while since I last updated this thread and since then, as some of you know, Lucas had to be put to sleep due to the effects of his illness. 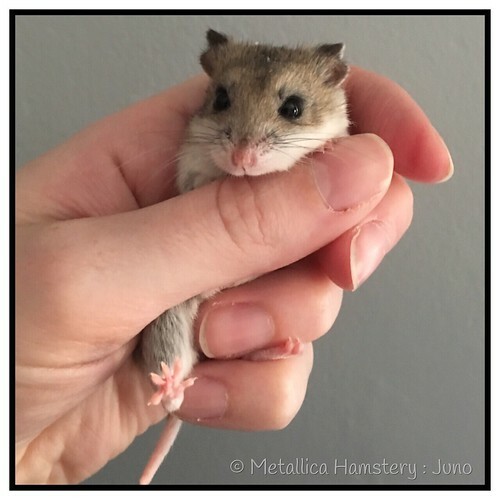 He was a sweet soul and is buried with the other Metallica Hamsters in the garden. Our other diabetic, Cora is still doing well. She was a bit unhappy recentely when I moved her cage away from James and next to Juno but now I've moved her back she's back to her usual self. James was paired to his fifth wife and got his cheek bitten and although he recovered quickly from that, he developed a respiratory issue that concerned me for quite a while. He has pretty much recovered from that and is in the process of being paired with Charlotte but things aren't looking too promising at the moment. After this pairing he will be retired and his sons Jack and Alex will be next up for pairings. 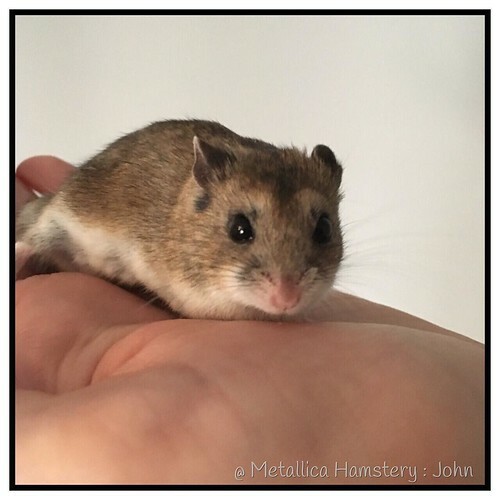 There is one Chinesey at Metallica that hasn't actually been formally introduced to you all yet... Lilliput's Mr John Bates at Metallica arrived on 27th September and made his debut on the show team a month later, coming fourth in the entire show. 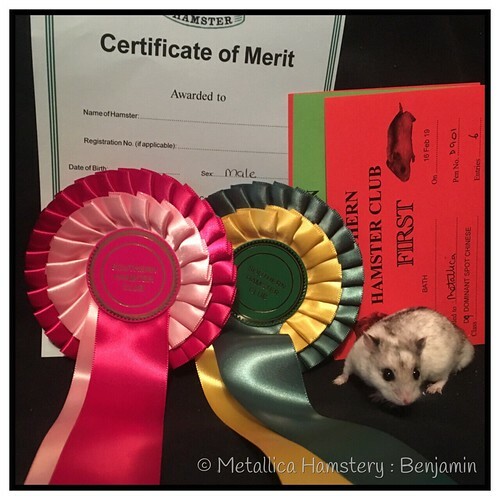 He was also awarded his first Certificate of Merit. John Bates is usually referred to as JB rather than John. Poor James has been in the wars! Good to hear he's feeling better now, I hope things do work out with his latest pairing, if not I'm sure his sons will soon do you proud! Good to hear Cora is still doing well in spite of her diabetes. Nice to se JB too. JB is so cute there. And a CoM already, what a star. Been catching up with your gorgeous thread of fluffiness and beauty. Every pic had me awwing and squealing with joy. Poor James getting bitten on the cheek. He sure gets through his wives lol! I thought that it might be about time for an update from The Metallica Chineseys. Since I last wrote, Charlotte was paired to James but due to aggression on his part, the pair did not remain together long enough for anything to occur. James was finally retired from breeding and Charlotte was tried with both Jack and Alex and was not too keen on either. In hindsight, it was probably for the best as Alex went on to develop diabetes. I decided to give Charlotte a rest from attempted pairing as she'd become rather high maintenance and brought in Jodie who I had hoped would be a suitable wife for Jack once old enough but she also developed diabetes and could not be used. Jack went on a breeding holiday over Christmas but failed to produce pups. As you may know, Lord James died peacefully in his bed at the end of January at the grand old age of three years and almost six months and his son Alex was put to sleep less than a week later due to his struggles with diabetes. 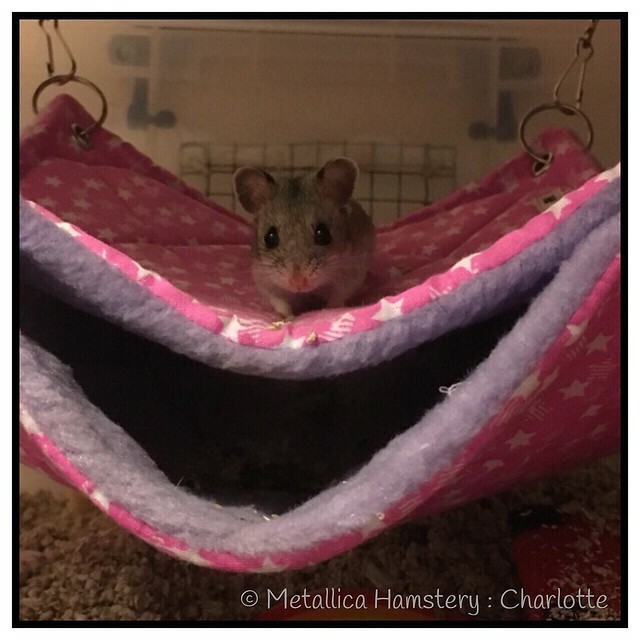 Jack returned from is holiday the following day as the new 'Earl of Metallica' and will be paired again with both Charlotte and a girl that has come here on a holiday. I am really keen to continue on James's bloodline and Jack is now the only chance I have. The Show Team have been doing well with John being awarded his second COM at the end of last year and Ben being awarded his first at the beginning of this year. I hope that both of these two lads will remain key members for the majority of this year's shows as Jack faces retirement. 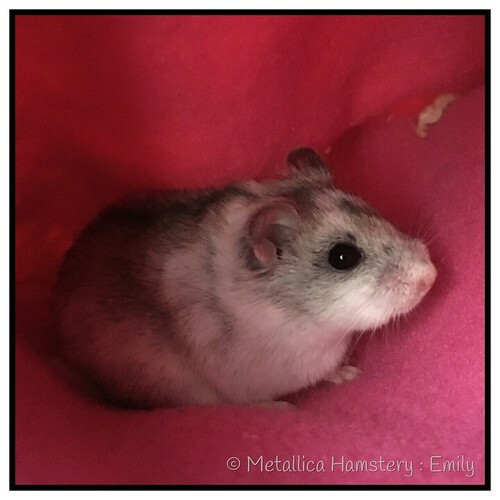 Metallica Hamstery also welcomed Emily Rhiann at the beginning of the year. 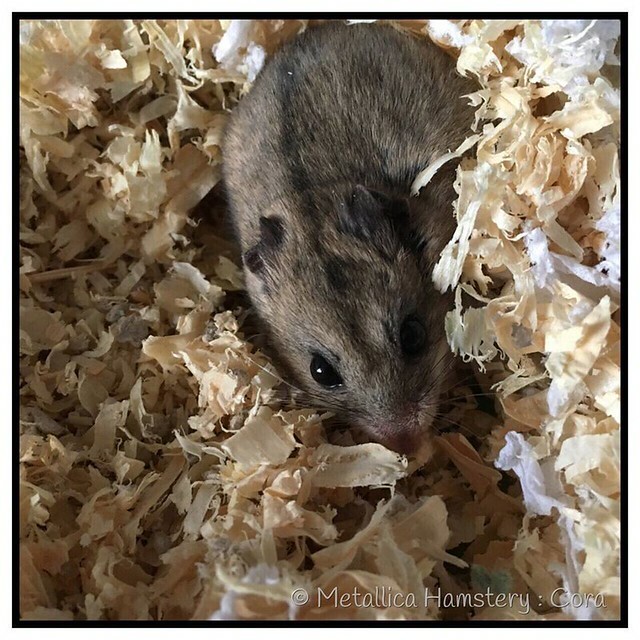 I didn't actually set out to get another hamster at the Bath show but once I set eyes on Emily, I couldn't say no. 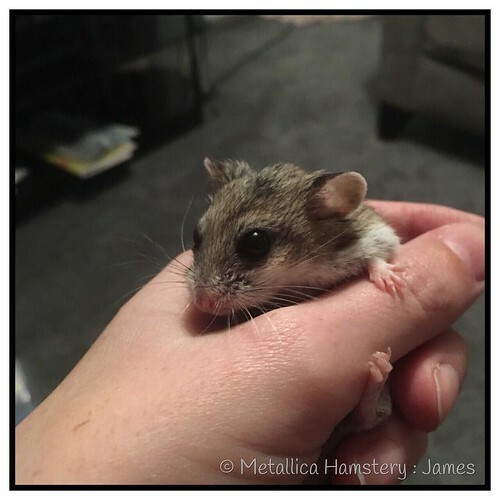 She is only the fourth Dominant Spot in Metallica Hamstery's entire history.